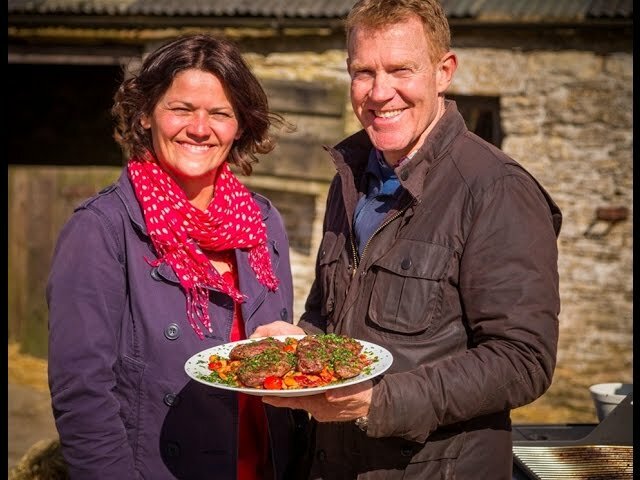 Genevieve Taylor and Adam Henson - Lamb Leg Steaks with caramelised onions, butterbeans & gremolataLamb seems to have fallen a little from fashion as a barbecue favourite - so here is a succulent recipe to inspire! Gremolata is an incredibly easy post-cooking ‘sprinkle’ of lemon zest, finely chopped garlic and flat leaf parsley that adds a fresh zing to the finished dish. Fire up one of the burners to medium low and set a heatproof frying plan (no plastic handles) on to the grill bars. Add the onions, thyme and bayleaf, stirring together. Lose the lid of the barbecue and leave to cook gently for about 30 minutes, stirring once or twice to make sure its cooking evenly. They want to be really soft and almost melting, but not with too much colour, so keep the heat fairly low. Make the gremolata by simply mixing everything together really well in a small bowl. Use a little salt to crush the garlic to a paste, then add to the cooked onions, along with the smoked paprika and season well with black pepper, stirring over the heat for a minute or so. Turn the heat up to medium high and add the tomatoes and beans and stir well, allowing them cook whilst you cook the lamb. Fire up another burner to high, and leave it to get hot for a few minutes – this won’t take too long as the barbecue is already warm. Drizzle a little oil over the lamb steaks, and season with salt and pepper. Lay them onto the hot grill bars and cook for 3-4 minutes each side. You can check the steaks are cooked how you like them by using a thermometer. Stick the probe into the thickest part of the steak – rare will be 50°C, medium will be 60°C, and well done will be 70°C. Remove the steaks and allow then to rest on the warming rack for a few minutes. Check the seasoning in the beans, adding a little extra salt and pepper if necessary, and squeezing in a little lemon juice to taste. To serve, add a pile of beans to warmed plates, and top each with a lamb steak. Sprinkle over a little gremolata and serve the rest in a bowl alongside.